MXA test riders wouldn’t make very good motivational speakers, because we aren’t very diplomatic. We don’t pull any punches. It’s as though donning the orange helmet is like taking truth serum. Case in point: although there are good things about every single bike ever made, we have yet to test a bike that doesn’t chafe us with one or more of its features. Our job is to question the manufacturers’ decisions, push them to make changes (by pushing their bikes to the breaking point) and then tell you everything we have learned. And so, here we are at the “2015 MXA 250 Four-Stroke Shootout.” It has taken us months to complete. Why so long? We don’t do shootouts based on one day of riding. Instead, we begin the process with the very first bike we receive and continue it until we are satisfied. For this shootout, it took us four months of constantly pitting each new bike against the others. Sometimes we would take all six bikes with us to a race; sometimes we would take just two bikes for a day of riding, but by the time we were ready to put pen to paper, we had tried everything possible. We understand that buying a new bike is an investment—and we want you to know what you are buying. 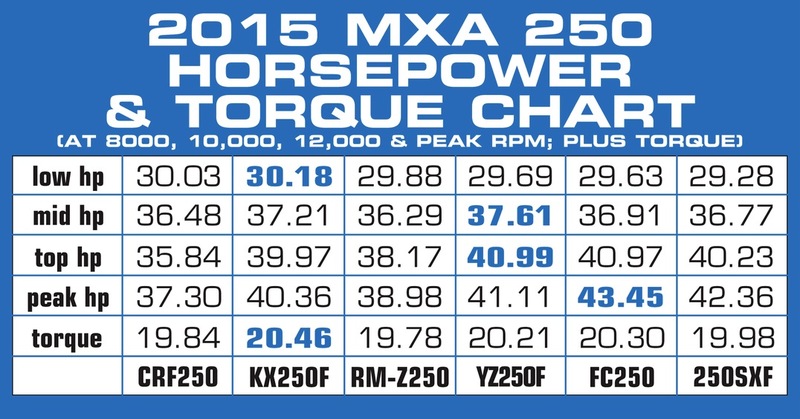 Never in the history of MXA’s 250 four-stroke testing have we had such a tight finishing order. Two bikes stood out among the field, but third place could have easily gone to any one of four bikes. There is a bike for everyone in this year’s graduating class. In the end, it all comes down to personal preferences; in this case, the MXA test riders’ personal preferences. But it’s your money, so read each one of our opinions carefully before opening your wallet. Click on the links above each bike to find out more about that machine. WHY DID THE KTM FINISH SIXTH? Someone has to finish last, and KTM has that dubious honor this year. While the 250SXF has many great attributes, it continues to flounder in two pivotal areas of 250 four-stroke warfare: suspension and powerband. Although the all-new WP 4CS fork is a step in the right direction, it is not set up properly. If top-end power is your cup of tea, then the 250SXF engine will sing a sweet tune, but most riders will never be able to maximize the horsepower gains at high rpm. WHAT’S GOOD ABOUT THE 2015 KTM 250SXF? (1) Hydraulic clutch. It is smooth, self-adjusting, fade-free and works very well. The hydraulic clutch has a unique feel compared to a conventional cable-actuated clutch. (2) Front brake. We can get the rear brake to chirp like a singing chipmunk when the brake heats up, but there’s no better front brake on the market. Honda and Kawasaki upped their front-brake systems for 2015, but they don’t hold a candle to the 250SXF. (3) Starting. Not only is the electric starter a welcome relief for lazy riders, but the engine is scary fast at high rpm. 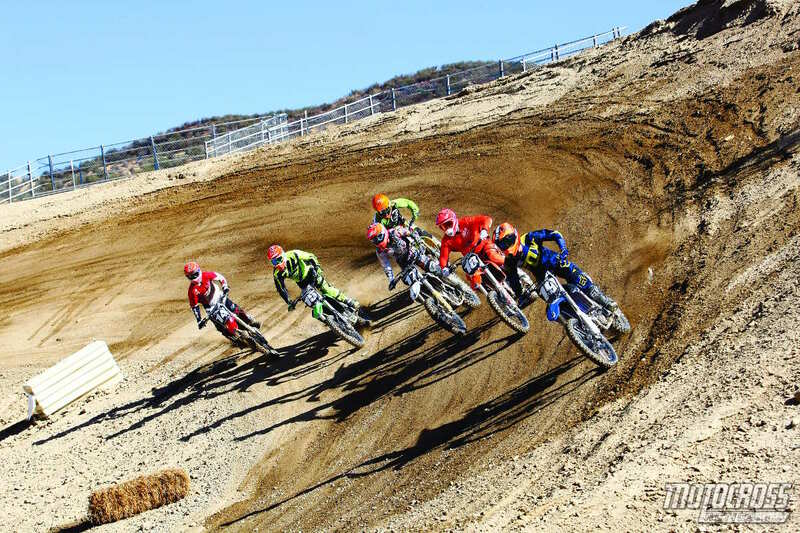 The 250SXF is a holeshot machine if the start straight is long enough. (4) Reliability. KTM is quickly becoming known for reliability. We haven’t suffered a single issue on the 250SXF. It’s also important to note that the bike continues to look great, even after months of moto thrashings. The in-mold graphics and robust plastics keep the 250SXF looking like new. WHAT’S BAD ABOUT THE 2015 KTM 250SXF? (1) Engine. With stock gearing, the 250SXF is a dog out of the hole. It doesn’t show signs of life until the rpm hits the midrange, at which point it runs like a scalded cat all the way to 13,400 rpm. (2) Gearing. Figuring out the best way to gear the 250SXF falls directly between Stonehenge and the Voynich manuscript on the list of the world’s greatest unsolved mysteries. We might have cracked the code by gearing the KTM taller, but then our slower test riders struggled to keep the engine on the pipe. (3) Suspension. MXA testers were elated to learn of the 250SXF’s new WP 4CS fork; that is until we set tire to track. Yes, the 4CS system is better than the old WP bladder fork, but in stock trim the fancy new 4CS is set up improperly. The forks are too stiff for all but the fastest riders; they refuse to go through their stroke. Not only that, but the WP shock is just average. (4) Handling. Guess what happens when the suspension fails to do its job properly? The handling suffers. On smooth tracks the 250SXF handles well, but once bumps form, the WP suspension can beat riders to a pulp. The chassis didn’t allow testers to settle into corners. If you can fix the suspension, this bike handles like a dream. (5) Engine braking. The KTM 250SXF suffers from engine-braking issues. Be sure to downshift at the last possible second to avoid loading up the suspension, which has serious consequences. WHICH SKILL LEVEL BEST SUITS THE 250SXF? This is a pro-level bike. It is possible for slower riders to find satisfaction in the 250SXF, but that will require the judicious use of money for aftermarket mods. WHAT ARE OUR FINAL THOUGHTS ON THE 250SXF? Why, oh why, does KTM continue to build a motorcycle that does little to benefit the average rider? We feel like we’re beating a dead horse by stating that the KTM 250SXF engine is too Pro-level and the suspension underperforms. However, those are facts that cannot be overlooked. The 250SXF is a good platform in need of some tender-loving care. If KTM moves the powerband down and fine-tunes the forks, we’ll talk again in 2016. WHY DID THE HUSKY FINISH FIFTH? The more appropriate question is, why did the Husqvarna FC250 finish in front of the KTM 250SXF? The bikes are identical in nearly every conceivable way, save for the plastics, airbox and subframe. Not only that, the FC250 airbox is a horrible design that does the engine no favors. However, testers preferred the feel of the plastic subframe when cornering and liked the broader feel of the FC250 powerband (once we figured out how to gear the FC250 properly). Coincidentally, the muffled airbox provides a more subtle transition when the power kicks in, which was a welcome feeling. WHAT’S GOOD ABOUT THE 2015 HUSQVARNA FC250? (1) KTM benefits. It’s hard to beat the hydraulic clutch, mighty front brake, electric starter and in-mold graphics that wear like iron. (2) Handling. We figured that the FC250 and KTM 250SXF would handle identically. Guess again. The polyamide subframe provided more flex, leading to a more comfortable riding experience. As a result, the Husky handled better. There was less impact transferred to the operator, because the plastic subframe soaked up some of the brutality caused by the WP shock. (3) Map switch. Husqvarna includes a two-position map switch on the handlebars. Map one is the standard setting, while the second map is for more aggressive hit. We preferred the second map. WHAT’S BAD ABOUT THE 2015 HUSQVARNA FC250? (1) KTM downfalls. The KTM 250SXF’s problems are the Husky FC250’s problems. The powerband is too top-end reliant. It is hard for Novices and Vets to get the most out of any engine that makes max power at max rpm. Eclipsing 43 horsepower may sound great, but it is of no value if a rider isn’t talented enough to milk every rpm out of the engine before shifting. The stock gearing is a mess, and excessive engine braking can be a hassle. (2) Suspension. We went all the way out on fork compression but didn’t make much headway in eradicating front-end stiffness. Draining 10cc of oil out of the 4CS fork helped, but we think that the FC250 could benefit from a suspension re-valve. (3) Airbox. The FC250 airbox is like the Berlin Wall. Mr. Gorbachev, tear down this wall! Several testers resorted to racing the FC250 without the left-side panel/airbox cover. Without the restrictive airbox cover, the throttle response picked up noticeably. Your best bet is to drill holes into the airbox cover and then clean your air filter regularly. WHICH SKILL LEVEL BEST SUITS THE FC250? Just as with the KTM 250SXF, the Husqvarna FC250 is best suited for faster riders or slow riders who refuse to shift out of second gear. WHAT ARE OUR FINAL THOUGHTS ON THE FC250? 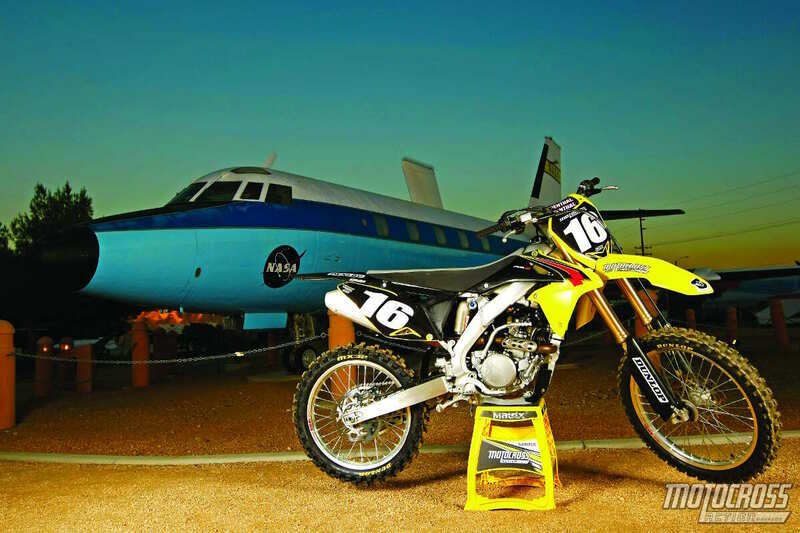 The Husky FC250 placed in front of the KTM 250SXF because every MXA test rider liked the way it felt—both in power delivery and handling. Other than that, it’s a bike that bleeds orange but is cloaked in white garb. WHY DID THE SUZUKI FINISH FOURTH? The RM-Z250 finished fourth place by the skin of its teeth. It could have been worse; some MXA test riders rated it last. And, it was never mentioned in the same breath as the class-leading KX250F and YZ250F. We didn’t punish Suzuki for failing to make quality updates to the 2015 RM-Z250, but the buying public probably will. Instead, the MXA wrecking crew docked the RM-Z250 several spots due to its inefficiency against the competition. WHAT’S GOOD ABOUT THE 2015 SUZUKI RM-Z250? (1) Cornering. The RM-Z250 has no equal when it comes to navigating tight tracks or where there’s a tuft of dirt to bang off of. It can hit inside lines with ease. The chassis is balanced, so transitional situations where the RM-Z250 must turn from one side to the other quickly are no problem. (2) Forks. Test riders have learned how to set up Showa Separate Function Forks, particularly on the RM-Z250. By stiffening up the compression and slowing down the rebound, we’ve discovered that the front end settles well in chop. (3) Engine. Truth be told, there’s a powerband in this shootout for every type of rider. The Suzuki RM-Z250 dwells in the midrange, which is an admirable trait for slower riders and those who prefer to short-shift through the gears. WHAT’S BAD ABOUT THE 2015 SUZUKI RM-Z250? (1) Engine. How can the RM-Z250 be on the good side of the ledger and still be considered bad? It’s all about the scope of competition. Four out of the six bikes in this test break the 40-horsepower barrier; the RM-Z250 is not one of them. (2) Clutch. Have you held an RM-Z250 clutch pack in your hands? It’s puny. Add in soft clutch springs and you have a recipe for clutch slippage. (3) Handling. Just because the RM-Z250 won the cornering category doesn’t make it a standout in the handling department. Cornering is one aspect of the handling category, but straight-line stability and controllability in transitional sections are also important. As good as the Suzuki is at carving turns, the bias on the front end creates instability when the perfect amount of pressure isn’t on the front tire. It can be scary to blitz a braking-bump-laden downhill on the RM-Z250. (4) Brakes. The front brake is bad, although not as terrible as the Yamaha YZ250F’s (but that’s due to the fact that the YZ250F has a superior engine, making it more difficult to stop). WHICH SKILL LEVEL BEST SUITS THE RM-Z250? This is a bike that excels in the hands of Beginners, Novices and Vets. It’s also excellent for anyone who rides tight tracks or only cares about cornering. WHAT ARE OUR FINAL THOUGHTS ON THE RM-Z250? 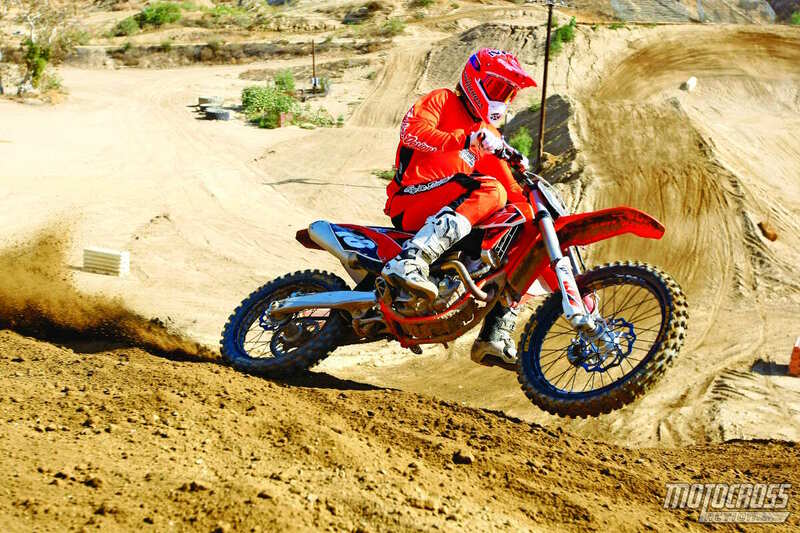 There are two standout areas that the MXA test riders loved—cornering and the forks. However, those bright spots cannot make up for the blasé powerband, pitiful clutch, tight ergonomics, subpar reliability, sketchy high-speed handling and weak brakes. 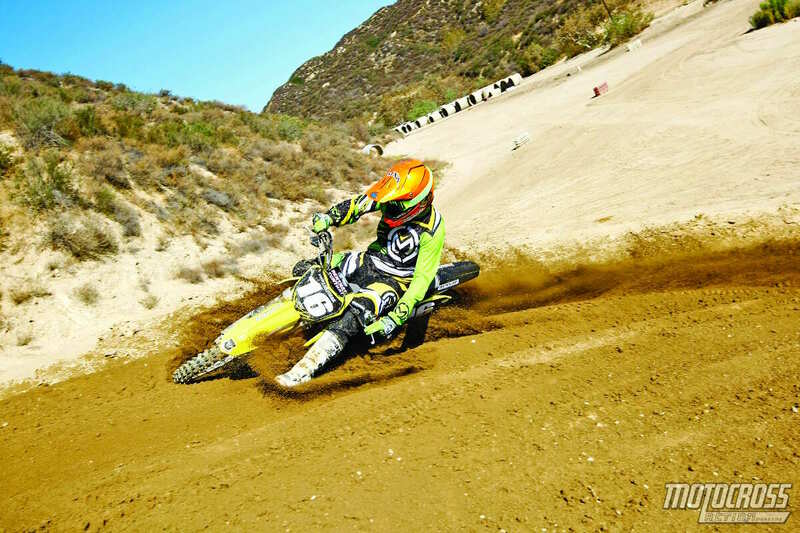 The RM-Z250 is showing its age against an ever-improving class. WHY DID THE HONDA FINISH THIRD? You should not be surprised to learn that Honda’s engineers aren’t the biggest fans of MXA. To their way of thinking, we have bashed the CRF250 ever since the bike followed in the same confusing footsteps as the CRF450 in 2010. We bashed the powerband because it is meager, and by meager we mean it produces 5 horsepower less than the class leaders. We bashed the CRF250 clutch because it feels like it is made out of putty. We bashed the twin exhaust system because it makes no sense from a weight, cost or performance perspective. We bashed the CRF250’s high-speed handling because this is a loose and busy bike in the rough. However, the 2015 Honda CRF250 does have quite a few redeeming qualities. (1) Testers raved about the Showa SFF TAC (Triple Air Chamber) forks, which improved the handling. (2) The bike is svelte, and the ergonomics make you feel like you are sitting in your favorite chair. (3) All the MXA test riders love riding the CRF250, even though they complained about the power, clutch, exhaust system and sketchiness. The Honda got third in the “2015 MXA 250 Four-Stroke Shootout” because it is very likeable. 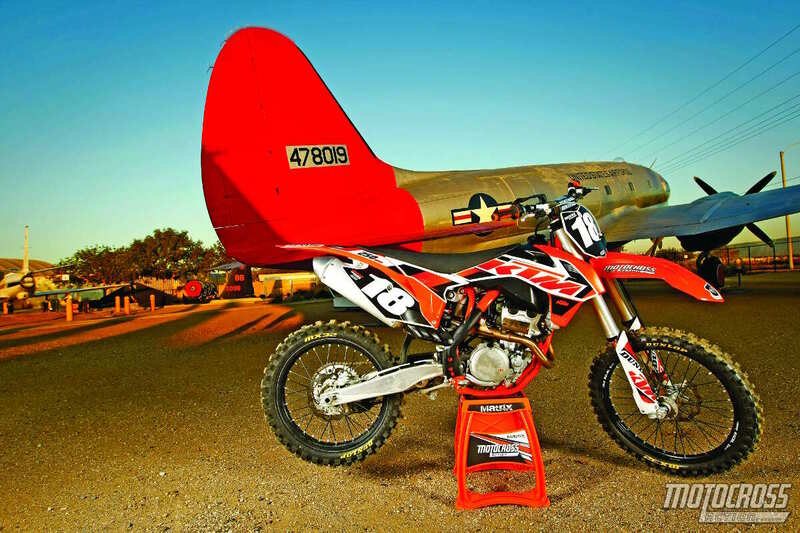 WHAT’S GOOD ABOUT THE 2015 HONDA CRF250? (1) Forks. Toward the end of MXA’s 250 shootout, you’ll notice that we chose winners and losers of specific categories. The CRF250 finished second to the Yamaha YZ250F in fork performance. In truth, finishing second to Yamaha’s SSS suspension is almost a victory. The Showa SFF TAC fork is very good once the desired air pressure is set. It is supple and forgiving, with a plush feel through the entire stroke. Good stuff. (2) Ergonomics. The CRF250 has always had a familiar feel. Kudos to Honda’s engineers for figuring out the magical distances between the handlebars, saddle and footpegs. (3) Front brake. Although not as powerful as KTM or Husqvarna brakes, the improved CRF250 front brake is decent. It ranks third among all brake systems because of its progressive feel. We still removed the front brake guard in order to flow more air to the caliper, lessen brake fade and improve access to the balance chamber’s air valve. (4) Cornering. There is a caveat to the CRF250’s cornering ability: The CRF250 hits lines best if the sag is set at 105mm, the forks are lowered in the clamps, the fork air pressure is set to perfection and the clickers are dialed in. Fortunately, the Showa air fork bolsters cornering performance for 2015. WHAT’S BAD ABOUT THE 2015 HONDA CRF250? (1) Engine. 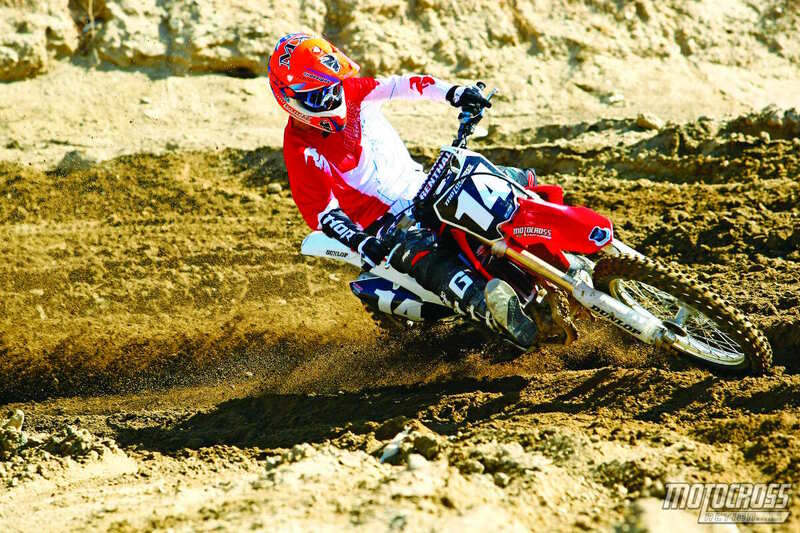 The CRF250 is as fast as a turkey in a headwind. It isn’t just slow—it is the epitome of slow. However, there’s a silver lining. Due to its lackadaisical nature, the CRF250 corners well and is very easy to ride. The red dog has a modest bark with no bite. In stock trim, this bike is best suited to Novices and Beginners. (2) Handling. Cornering is one thing, but getting the CRF250 to track a straight line in high-speed situations is downright scary. There is too much weight on the front end, and the HPSD steering damper does very little to help. (3) Exhaust. We detest the double-muffler design. It is heavy, prone to damage, expensive to replace and doesn’t offer a performance advantage. (4) Clutch. It’s pathetic. Inefficient doesn’t begin to describe the soft, spongy and fading CRF250 clutch. 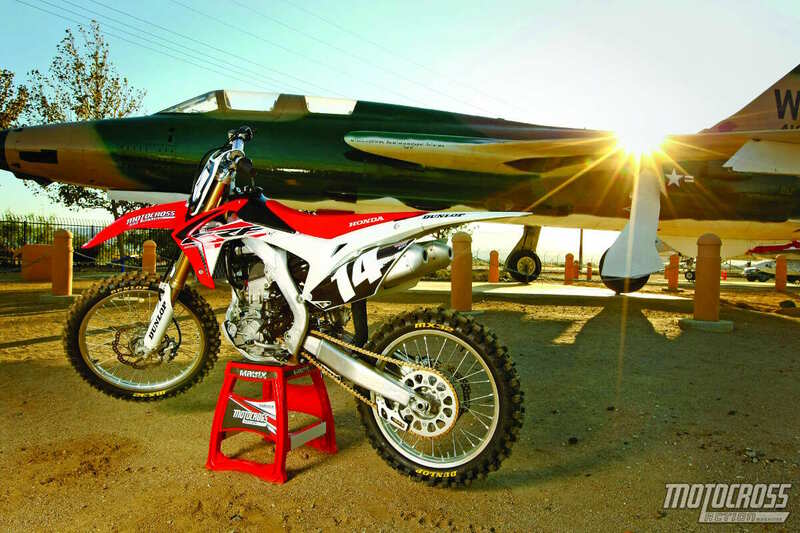 WHICH SKILL LEVEL BEST SUITS THE CRF250? This is a bike for Beginners, Novices and those who want to spend thousands of dollars hopping up the CRF250. It is also the perfect “professional practice racer” bike, because it can be neglected without skipping a beat. WHAT ARE OUR FINAL THOUGHTS ON THE CRF250? The odd thing is that Honda chose to make the CRF250 slow. They have the technology to make it blazing fast but don’t want to use it because of the misguided belief that riders need easier-to-ride bikes. We gave it third in our shootout in spite of Honda’s oddball powerband choice. WHY DID THE KAWASAKI FINISH SECOND? 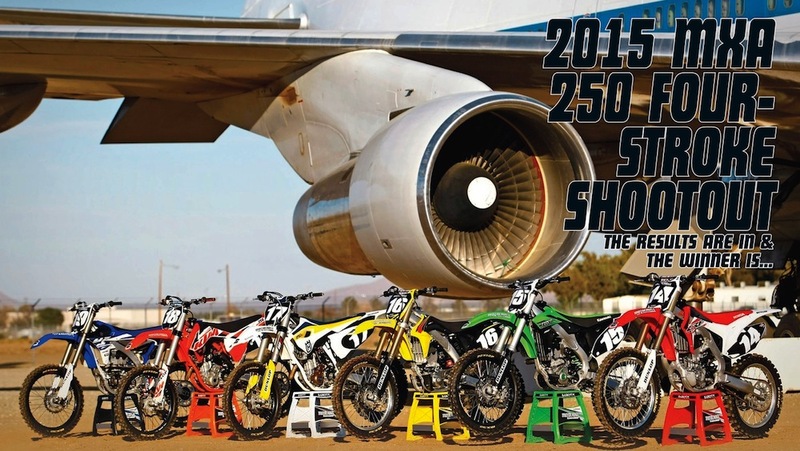 MXA’s “250 Four-Stroke Shootout” came down to a gun fight between the Kawasaki KX250F and the Yamaha YZ250F. In the end, the Yamaha took top honors. Why? Superior YZ250F suspension, handling and cornering. Every year, as we gave the KX250F the top spot in past shootouts, we stated that the KX250F was only winning because of its engine—not because of its weak clutch, vanilla suspension and old-school handling. In 2015, the chickens came home to roost, and Yamaha caught Kawasaki napping. The KX250F still had its fans among the MXA test riders, and the final margin of victory was razor thin for Yamaha. WHAT’S GOOD ABOUT THE 2015 KAWASAKI KX250F? (1) Engine. The KX250F has arguably the best powerband in the class. It certainly has the broadest usable power, thanks in part to the dual fuel-injection system. Every tester, with skill levels covering the spectrum, believed that the KX250F was superior to the YZ250F on faster tracks. (2) Suspension. Although not as good as Yamaha’s Kayaba SSS suspension, the KX250F Showa SFF setup is very good. We’ve grown to like the Separate Function Fork for its tuneability and ability to absorb rough chop without transferring energy to the rider. Unfortunately, the shock is partly to blame for the lazy cornering characteristics. (3) Front brake. The oversize 270mm Braking front rotor helps Kawasaki in the braking category, although it’s still not as precise as KTM’s and Husqvarna’s front-brake setup. We are happy to report that the KX250F front brake is finally improved after years of benign neglect. (4) Couplers. 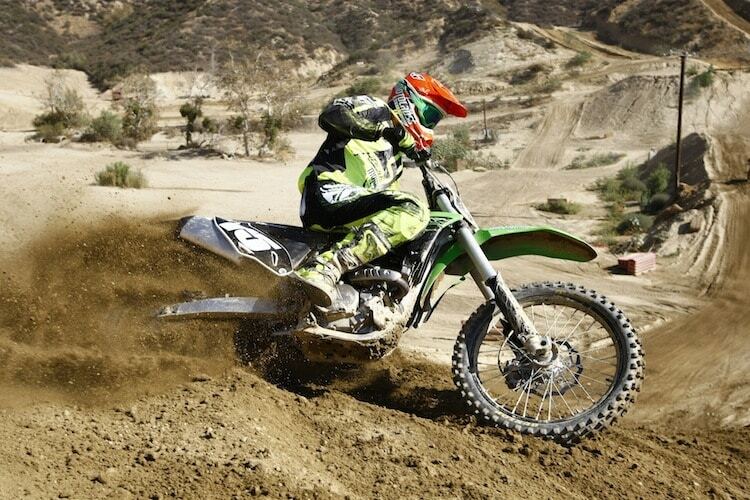 We strongly advise KX250F owners to try the plug-in mapping couplers that come with the bike. The green coupler is standard, while black is mellow and white is aggressive. In our opinion, the white coupler is best in nearly all conditions. WHAT’S BAD ABOUT THE 2015 KAWASAKI KX250F? (1) Cornering. At some point Kawasaki will need to improve the KX250F cornering traits. In stock trim, the front end has a tendency to understeer, which translates into a considerable amount of rear-end input. That might work for some riders, but unfortunately the shock wallows under heavy acceleration. Thankfully, there are fixes to these numerous riddles—different offset triple clamps and a longer link arm—but they will cost you. (2) Shifting. Kawasaki has tried for many years to solve the KX250F’s shifting woes, but the transmission is still problematic. Testers had difficulty shifting to a higher gear when the engine was under a heavy load. (3) Clutch. Although not the worst in the class, it doesn’t compare in longevity or consistency with the KTM and Husqvarna clutches. Do yourself a favor and buy stiffer aftermarket clutch springs. 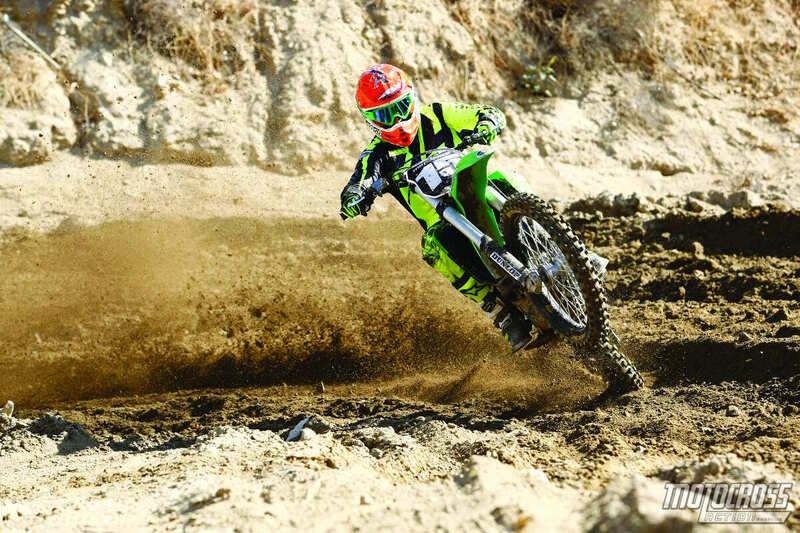 WHICH SKILL LEVEL BEST SUITS THE KX250F? The KX250F welcomes every type of rider, but it’s especially attractive to taller and heavier riders. Why? The four-position handlebar mounts and two-position footpeg options increase comfort in an already open cockpit. WHAT ARE OUR FINAL THOUGHTS ON THE KX250F? Kawasaki isn’t used to the bridesmaid position in the “MXA 250 Four-Stroke Shootout.” But, Kawasaki got complacent in its role as class leader. The KX250F is way, way, way ahead of third, fourth, fifth and sixth in this shootout and only a gnat’s hair behind the winner. 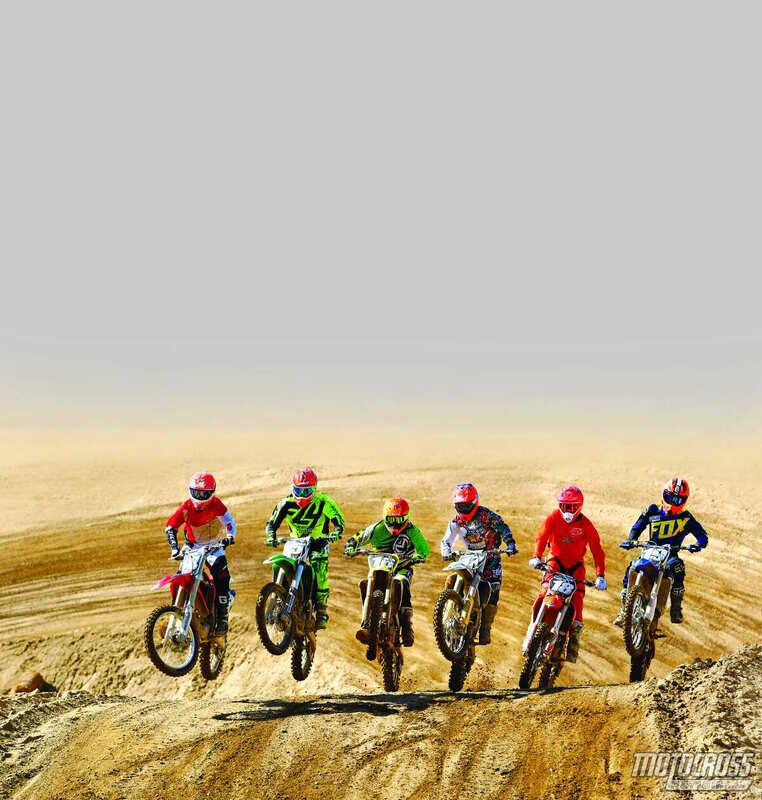 WHY DID THE YAMAHA WIN MXA’S 250 FOUR-STROKE SHOOTOUT? Behold, the victor! It wasn’t easy. On fast tracks, the Kawasaki KX250F performed better, but overall, the YZ250F was supreme. MXA test riders loved the proven Kayaba SSS suspension. It was light years better than the air, single-spring and Austrian competitors. Thanks to the flawless suspension, the handling remained neutral and the rear wheel stayed connected to the ground. Of course, we couldn’t overlook Yamaha’s do-it-all engine, which is one of the bike’s strongest areas. The 2015 YZ250F is a winner. 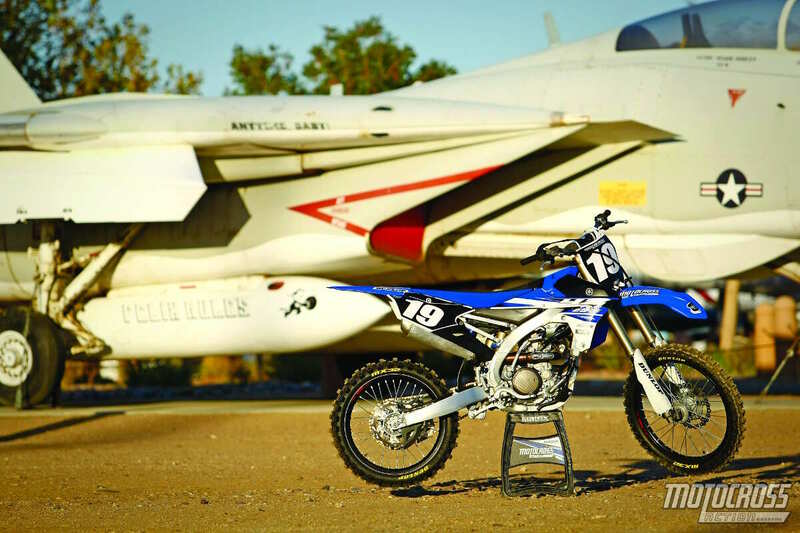 WHAT’S GOOD ABOUT THE 2015 YAMAHA YZ250F? (1) Suspension. Kayaba’s Speed Sensitive System (SSS) suspension is eight years old. Guess what? It’s still the best stuff out there. The forks are incredibly plush and consistent with excellent bottoming resistance. The shock is as good as the forks, creating unity between the front and rear. (2) Engine. Snappy, broad and emphatic are three words that aptly describe the YZ250F powerband. It has very usable bottom-end hit, excellent midrange and adequate over-rev capability. Best of all it exhibits and unweilding willingness to pull tall gears. It is a jack-of-all-trades engine. (3) Handling. Although it didn’t win the cornering category, the YZ250F is one of the best all-around-handling bikes in the class. Thanks to a stable chassis and supple suspension, big blue is steady at high speeds and mostly agreeable in corners. (4) Durability. We put over 100 hours on last year’s YZ250F and didn’t encounter a single problem. This is a bike that is built to last. WHAT’S BAD ABOUT THE 2015 YAMAHA YZ250F? (1) Brakes. The front brake is the worst in the class. It is underpowered and lacking positive feel at the lever. Yamaha needs to join the 21st century by upgrading its antiquated front brake. (2) Cornering. 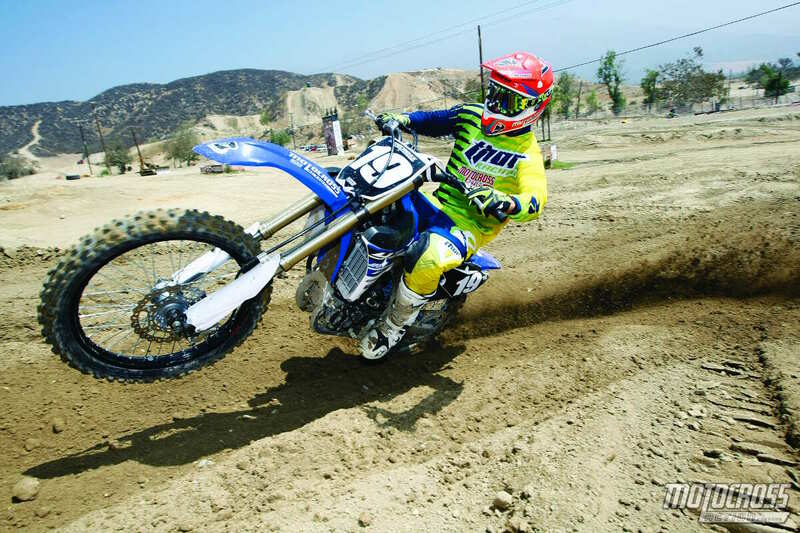 At times, the YZ250F has to hunt and peck for traction. It exhibits an uncomfortable looseness on flat turns with nothing to bite into. (3) Handlebars. We didn’t like the handlebar bend. For our tastes, a switch to Renthal’s 997 TwinWall handlebars did the trick. 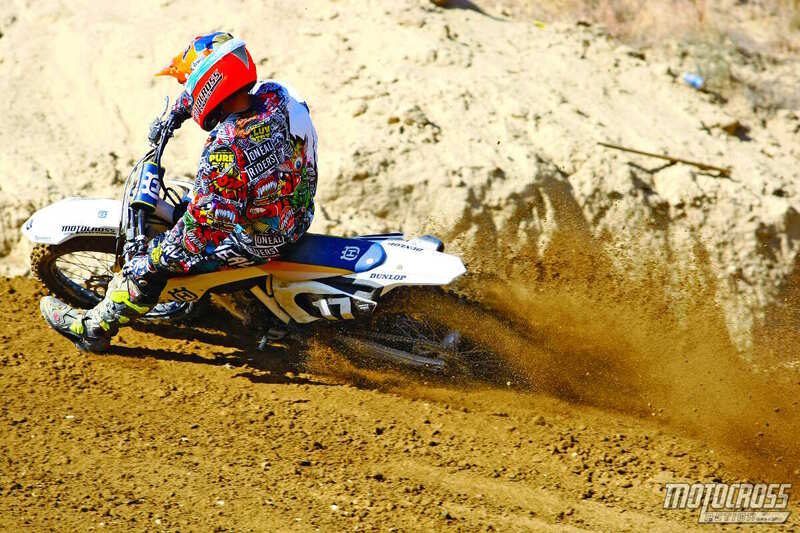 WHICH SKILL LEVEL BEST SUITS THE YZ250F? The magic of the Yamaha YZ250F is that it performs well in the hands of every skill level and age bracket. WHAT ARE OUR FINAL THOUGHTS ON THE YZ250F? Yamaha narrowly lost last year’s shootout because of its quirky cornering traits. Although the quirkiness is still evident, the 2015 iteration has slight revisions and considerably better suspension. That was enough to seal the deal and make the Yamaha MXA’s “250 Four-Stroke Shootout” winner. Metrics aren’t indicative of placement in our shootouts, and it’s interesting to note that tabulated scores don’t exemplify the most important characteristics of a bike. For example, we don’t believe that brake performance carries the same weight as the powerband. However, for those statisticians among us, be pleased to learn that the Yamaha YZ250F, with 23 points, finished tops. The KX250F (30 points) was second. 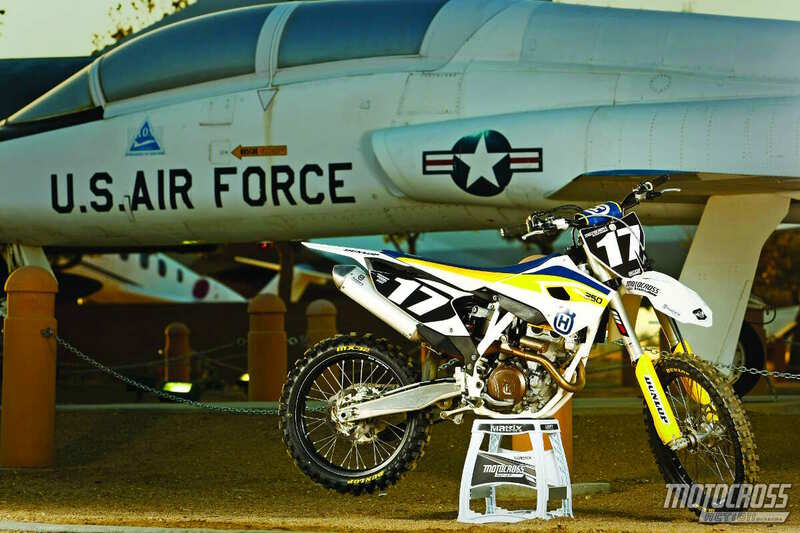 Interestingly, the Husqvarna FC250 (41 points) bested the Honda CRF250 (44) and Suzuki RM-Z250 (45). However, superior brakes, clutch and top-end power aren’t reason enough to give the FC250 third place. Lastly, the KTM 250SXF, at 48 total points, was docked because of a displaced powerband and poor suspension. WHICH BIKE DID THE MXA TEST RIDERS PREFER? Notes: The chambers are inter-related. It’s not possible to access the outer chamber without installing a Schrader valve. Notes: Fork-leg height is a viable solution to balancing out the fore-to-aft feel of the FC250. On tighter tracks, we raised the fork legs to put more emphasis on the front wheel. Also note that achieving harmony between the forks and shock should be your first goal. Having one area out of sync will wreak havoc on the handling and suspension performance. Notes: Use the preload adjuster and fork-leg height to your advantage. Find the best balance between the forks and shock before dialing in the clickers. Some testers preferred to run the preload adjuster farther in than stock. Notes: Use fork leg height to help balance the chassis. On tighter tracks, we raised the fork legs to put more weight on the front wheel. If the forks feel too stiff, lower the oil height by 10cc. Notes: The RM-Z250 is very sensitive to fork-leg height. We found that running the forks flush with the top triple clamp balanced the suspension and fixed the minor head-shake that we encountered through fast and rough sections. We also tightened the steering stem to prevent excessive head-shake. Note that when the forks are new, they need about an hour of ride time before they properly break in. Notes: Lighter riders will find comfort in lowering the oil height or dropping down a spring rate. Also, be mindful of fork-leg height, as it’s instrumental in finding chassis balance. Notes: If you’re concerned that the stock 5.4 Nm spring rate is too soft, be sure to measure the static sag after setting race sag. If static sag is more than 40mm, it’s imperative that you jump up a spring rate. Also, understand that the FC250 is very sensitive to race sag. Notes: These settings are geared toward a heavier rider (170-plus pounds). We think that the KX250F works best with the low-speed compression turned in while using the high speed to adjust the ride height at speed. Notes: The shock is very sensitive to sag. We also went to a heavier spring rate. Be sure to measure static sag after dialing in the race sag. If static sag is more than 40mm, then you’ll need to go up a spring rate. Notes: The shock takes about an hour to break in. Continue to check the sag until the shock is completely broken in. Don’t discount the shock when it comes to handling. If it is too stiff or the race sag too little, the RM-Z250 can go from a sweet-handling machine to a yellow ogre. Balance the front and rear with careful setup.